Gerry Adams has been a public figure for the best part of the past 40 years. For at least 30 of those years he has been an elected representative with a poll-topping record the envy of many other political leaders. For the same period sections of the establishment media, especially the BBC and RTE have relentlessly pursued him and treated him with hostility the most recent example being TV3’s programme last Monday night - Sinn Fein: Who Are They? The pursuit of Gerry Adams has all to do with what he believes in and represents and has little or nothing to do with claims by journalists that they are objective investigators. Claims of ‘objectivity’ are a self-perpetuating and self-serving myth, especially by Belfast-based journalists ensconced in the BBC and Dublin-based journalists in RTE. Both are advocates of the status quo: a partitioned island with a unionist bias in the BBC and an anti-republican partitionist bias in RTE and both agencies are riddled with class-prejudiced journalists. Most of the establishment media are opposed to what Gerry Adams stands for: a united Ireland and a different society based on the socialist principles of equality; the sharing of wealth and the empowerment of working-class people to ensure they are in the governmental institutions that run their lives. There is a political and class prejudice in the media against Gerry Adams. His working class Ballymurphy republican roots and his outstanding ability to represent the republican cause and see off his detractors in the media fuel the prejudice. His self-educated background inside and outside prison; his self-taught writing skills as an author and columnist are a mark of distinction and particularly infuriate those university-educated journalists who prey on him. If, when using Irish (for which he should be congratulated) he makes a mistake, it becomes the occasion for derision. 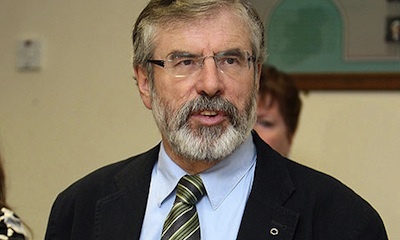 The establishment media resent the fact that as a republican leader Gerry Adams has built up a considerable political following which can be seen in the electoral growth of Sinn Fein, north and south, and the considerable potential for further growth of Sinn Fein, particularly in the south. He is also highly regarded by many people who do not support Sinn Fein but do appreciate his contribution to Irish politics. But there are journalists with an agenda - who pompously think their ‘story’ will be the one to topple Gerry Adams. Rather than the Sinn Fein grass roots deciding who their leaders should be, they think they have that divine right. When the armed conflict was taking place the media mantra was “Sinn Fein/IRA” and Sinn Fein was held responsible for every IRA action. Next was the media obsession over whether Gerry Adams was a member of the IRA. Its treatment of him before and after his brother Liam was convicted for sexually abusing his daughter is perhaps the most shameful episode of the contrived media campaign. Despite this campaign abysmally failing to dent Gerry Adams’ popularity it is pursued with a renewed vigour, as one group of journalists (younger and keener) replace the aged and burnt out cases who are left to cheer from the side lines. None of this of course surprises republicans nor does it affect the standing of Gerry Adams as leader of Sinn Fein. Gerry Adams is revered by party activists and the more he is criticised the more his personal integrity shines through. Of equal importance the media has abysmally failed to undermine Gerry Adams’ personal standing and Sinn Fein’s poll ratings. But this reality will not deter those self-appointed guardians of public probity. What may, however, put the brakes on an unaccountable and out of control clique is a Patten-style investigation into the media. In this post-conflict era they are the one agency left to regulate their own behaviour and set their own standards. They were ‘players’ during the armed conflict and are still. This abuse of power has to end. It is time the media was democratically regulated and made accountable to the public, certainly those journalists in the BBC and RTE paid by taxpayers.